A bag of butter beans was the inspiration for this month’s Irish Foodies’ Cookalong. Soaked overnight, then thrown into the pot by themselves – or with some onions, carrots and celery – for about an hour the next morning, the beans needed little attention other than checking the water level every so often. And that’s the hard work done for this Greek Bean and Tomato Stew, which is based on a recipe by great Australian cook Jill Dupleix. The rest of the prep just involves making a simple tomato sauce, adding the beans and serving with some feta sprinkled over. While cooking this up on Friday night I had great ambitions for making my own flatbreads and adding some shredded Swiss chard from the garden. Plans were changed abruptly when we heard about a 7.1-magnitude earthquake in Christchurch, New Zealand, the city where we lived for a year and where three of the Husband’s sisters and two brothers-in-law are based. He was driving home from town, caught a line on the 7pm news and rang to see what I could find out online. Fortunately the mobile networks were still working so, just eight minutes after he heard the news, I had got messages back to say that all were safe and well. Even now, almost three days after the initial quake, they continue to be rocked by severe aftershocks. Our thoughts are with them as they deal with life in a city where a state of emergency has been declared, roads are cracked, buildings are collapsing, water systems have ruptured and all drinking water has to be boiled for three minutes. 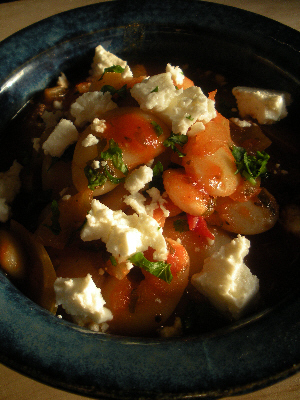 Sometimes a simple, warming bowl of bean stew sprinkled with salty feta cheese is immensely comforting. If you have greens that you want to add – I often use spinach or Swiss chard – just shred them finely and add to the pot for the last five minutes of cooking. Makes it into an even better one pot wonder meal. We often scoop this up with warm pita breads but it is also well worth trying it over baked potatoes or with rice. Any left overs make a rather superior beans on hot buttered toast. Cover the dried beans with cold water and soak overnight. The following morning, drain and rinse the beans. Place in a large cooking pot and cover with cold water so that it is at least 2½ cm over the level of the beans. Bring to a boil then reduce to a simmer, partially covering the pot. Depending on the age of the beans, they will take between 40-60 minutes to become tender. When they’re cooked through, add a teaspoon of salt and stir gently. These can be prepared ahead. Heat the olive oil in a heavy based pan and cook the onion until soft. Add the garlic, tinned tomatoes, tomato puree, sugar, bay leaves, cinnamon, oregano, fresh parsley and 100mls water and simmer for 30 minutes. Drain the beans, add to the tomato sauce – with more water if necessary – and simmer for another 10 minutes. Sprinkle the feta over to serve. While the stew tastes good otherwise, the feta just lifts it into a higher category, all salty and savoury alongside the sweetness of the tomatoes and spice. A little chilli is good too but, seeing as this was Little Missy’s dinner too, we can’t use too much – yet! Oh, lord, I read about this on an NZ blog I read, but didn’t expect to see it having an effect here – so glad everyone’s ok – terrifying.The stew looks great! Will try that. @English Mum, @Jo fortunately everyone was alright, although pretty shook. They’re still getting pretty large aftershocks so it seems as if everyone is exhausted with trying to cope with daily life while the ground still shakes, more than ten days later. Our thoughts are still with them, especially the Husband’s sister who is due her first child next week.Hope you both enjoy the stew. It’s also easy (although perhaps against the rules for the Vegetarian Cookalong!) to turn into something more meat-orientated with the addition of some bacon or chorizo.